For the past two years, the Atlanta Braves have been hard at work on a massive rebuilding project, trading away assets and collecting young talent. Heading into 2017, the Braves finally appear to be ready to start climbing the ladder in the NL East after a National League-low 68 wins last year. So, can the Braves make some noise in 2017, or are they still a year or two away from competing for a playoff spot? The Braves made several moves this offseason to address their starting rotation, trading for Jaime Garcia and signing veterans Bartolo Colon and R.A. Dickey to add more depth behind ace Julio Teheran. Atlanta relied on a lot of on young, unproven pitchers last year, but that won’t the case in 2017. Garcia struggled last year, but he’s due to bounce back in a contract year. Dickey wasn’t able to replicate his Cy Young season from 2012 during his four years in Toronto, but he should benefit from a return to the NL East and no longer pitching his home games inside a dome. Colon, meanwhile, was the definition of consistency during his three years with the Mets and should bring that to Atlanta’s rotation. The Braves still have a nice collection of young pitchers who can join the rotation if necessary. But if their starters can stay healthy, Atlanta will benefit from having a veteran rotation while their younger pitchers get a chance to develop in the minors. It may not be a rotation that will dominate the league, but the Braves do have a strong rotation that should keep them in most games. The bullpen is usually the last thing to be put into place for rebuilding teams, and so this could be an area of uncertainty for the Braves, at least compared to Atlanta’s rotation. If there’s a silver lining, it may be that Jim Johnson and Arodys Vizcaino both have closing experience, although the Braves will need Vizcaino to bounce back after a rough 2016 season. Outside of Johnson and Vizcaino, the Braves don’t have many proven commodities with regard to relievers, although the likes of Mauricio Cabrera, Ian Krol, and Jose Ramirez were solid last season. The Braves may also have the option of taking one or two of the young starters being pushed out of the rotation by their offseason acquisitions and moving them to the bullpen to give them more depth. This could give the Atlanta bullpen to be better than expected in 2017, although a lot of it will be dependent on how reliable Johnson and Vizcaino are on the back end. The Braves were one of the worst offensive teams in the National League last season, especially in terms of hitting for power, as they had the lowest slugging percentage in the majors in 2016. A full season with Matt Kemp, who was acquired at the trade deadline last year, should help Atlanta’s power, as Kemp can provide some protection for Freddie Freeman. The Braves should also benefit from a full season from top prospect Dansby Swanson, who appears ready to take over as the team’s every day shortstop. Catcher Tyler Flowers could also become more of a force offensively if he can stay healthy. The late addition of Brandon Phillips at second base could also pay dividends, as he should be a meaningful upgrade over the second baseman the Braves utilized last season. From top to bottom, Atlanta’s lineup looks quite formidable. The Braves have table setters in Swanson and Ender Inciarte, as well as power threats in Freeman and Kemp. 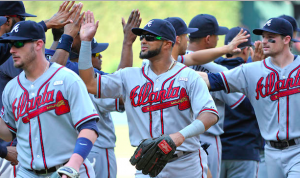 If Atlanta can get consistent production from Flowers, Phillips, Nick Markakis, and Adonis Garcia, the Braves should have considerable depth in their lineup. If the Braves have a weakness in their lineup, it could be their bench and a lack of options in case the team suffers injuries, as they’ve already lost utility man Sean Rodriguez, possibly for the entire season. The Braves were absolutely dreadful the first half of 2016, but they played much better baseball the second half of the season, so there’s some optimism that they can carry that into 2017. This year’s Braves appear to be considerably better than the team that won 68 games a year ago. A 10-win improvement is a distinct possibility, although if you factor in injuries and the uncertainty in the bullpen, they may not quite get there. The Braves will go 76-86 this season, which will be good enough to take them out of the NL East basement and have them competing for third place in the division, which for them will be a big step in the right direction.